I passed Ensigns yard on HS1 earlier, an absolute sea of red double deckers! From Mr Neil Jordan: Bristol VR RAH260W. From London United: Scania Omnicity YN08DHL. Volvo B7TL/Wright Eclipse Gemini LB02YXN/YXM: Littles Transport, Derby. Enviro 200 GX09AGZ: EOS Buses, Rainham, Essex. Volvo B7TL/Plaxton President PJ53NKK: The Big Lemon, Brighton. Volvo B7TL/ALX400 LJ53BBZ: Country Bus, Newton Abbott, Devon. Dart WK06AEF: Avondale Coaches, Clydebank. Volvo B7TL/East Lancs Myllenium HX51ZRE, Volvo B7TL/Plaxton President PJ53NKW: York Pullman. Volvo B7TL/Wright Eclipse Gemini LX53BJO/LJ03MDK/LJ03MHN: Kingsley Coaches, Durham. Dart LR02BDX: Bear Buses, Feltham, Middx. Volvo B7TL/Wright Eclipse Gemini LX06ECJ: Belle Vue, Manchester. Volvo B7TL/East Lancs Myllenium PN02XCC, Optare Spectra’s T413/417/420UON, Olympian R752GDL: Shelton Motors, Ely for scrap. Volvo B10M Y783MFT: Southern Transit, Brighton. Enviro 200 LK07BEY, Scania Omnicity YN08DHF: UK Coachways, Bolton. Darts HW54BTV/BTX, Dart SN56AF, Enviro 200 MX08ZFA : Buses ETC, Merstham. Volvo B9TL/Wright Eclipse Gemini 2 BX12CVP/CVL: Travelmasters, Sheerness. Volvo B7TL/Wright Eclipse Gemini LB02YXJ: JD Travel, Oxford. Volvo B7TL/Wright Eclipse Gemini LB02YWZ: Thandhi Coaches, Smethwick. Dart LR02BEJ: Stotts Buses, Oldham,. Scania YN03DFL : Stagecarriage, Stockton-on-Tees. Enviro 200’s PX12COJ / COH : Faresaver, Chippenham, Wilts. Dart KX05KFC: Red Route Buses, Northfleet. Volvo B7TL/Wright Eclipse Gemini BX54DJZ/BX55XLW: New Horizon, Clacton, Essex. Volvo B7TL/Wright Eclipse Gemini LG02KHE: Tom Halls Taverns, Liverpool. Volvo B7TL/East Lancs Myllenium PN02XCJ: APN International, Colombo, Sri Lanka. Olympian F358WSC: BOOM consultants, London N1. 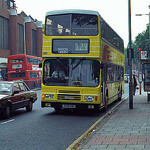 Dart 798 sold to EOS Buses, Rainham, Essex. Trident/ALX400 156 sold to Carters Coaches, Kettering. Volvo B7TL/ALX400 903 sold to Goodwins, Eccles, Manchester. Enviro 651 sold to Grant Palmer, Flitwick, Beds. Enviro 701 written off by insurance co and collected by them. From Brightbus : Volvo B7L’s SA52DVT/DVV/DVW/DVZ. Volvo B9TL’s BN61MXM/MXR/MXS/MXT/MXU/MXW/MXX/MXY/MYA/BG61SXK : Arriva London. Olympian R758GDL : Lyng Primary School, West Bromwiwch. Dart SN54GPV : Galleon Travel, Roydon, Essex. Darts SK02XHH/SN51UAZ : Nu-Venture, Maidstone. Trident SN53KHR : CARDINAL Buses, Addlestone, Surrey. Volvo B9TL’s BG61SXJ/SXR : Lothian Buses. Volvo B9TL’s BX12CVK/CVM : Faresaver, Chippenham, Wilts. Volvo B7TL’s LX05FAF/FCC/EYO/FCE : Symphony Chauffeurs, Heathrow. Cheetah YX14EFS : Peter Godward Coaches, Basildon, Essex. Volvo B9TL’s BG61SXN/BN61MYB/MXS/MXP/MXO : Lucketts Coaches, Fareham, Hants. Olympian G338CSG : Ben Stonehouse, Scarborough. Volvo B7TL LF52ZTG : Mullaneys Coaches, Watford. Tridents LX03BYA/OSB/BXS, Dart SN03YBH : Springfield Coaches, Warrington. Volvo B7TL’s LF52TGU/TGY/THK/TJU : Skills Coaches, Nottingham. Enviro 200 YX09FLF : Vale Travel, Aylesbury. Volvo B7TL LX05FCF : Selwyns Travel, Runcorn. Olympian R387LGH Darts SN03WMP/WMC Trident SN03DZR : Meritrule, Kingswood, Surrey. Olympian R362LGH : WH Fowlers, Holbeach Drove, Lincs. Volvo B7TL PJ53NLC : York Pullman. Solo NT55JKJ : Henshaws Coaches, Moreton-in-Marsh, Gloucs. Solo NK54DFA : Swanbrook Coaches, Cheltenham, Gloucs. Solo’s YN53YGY/PM04MKP/YN04LWZ/YJ54UWN/NT05NMB : Scarlet Band, West Cornforth, County Durham. Scania YN08DHL : UK Coachways, Bolton. Mercedes T35RJL : Mr S Nduza, Harare, Zimbabwe. Trident S802BWC : Parole in Movimento, Italy. Scania’s YU52XVL/XVM : Sleafordian, Sleaford, Lincs. Volvo B7TL’s HX51ZRJ/ZRD : AC Williams, Ancaster, Lincs. Volvo B7TL W492WGH : Ridleys Coaches, Kenilworth. Volvo B7TL’s HX51ZRG/ZRK : Seaford and District. Trident LX03BXY : First Bus Stop, Gravesend. Volvo B7TL LF52ZPU : John Donne Primary School, London SE15. Darts SN03YBC/YBZ/WLX/WLZ/WMF : Hardwick, Barnsley for scrap. Tridents 158 / 159 sold to Aintree Coaches. Hmmm - no mention of the Abellio Green TAs that have been pictured at Ensign over the last few weeks. The plot thickens! The "vehicles in" listing sometimes misses a few batches out. Perhaps it depends on whether ownership has changed at that point? Ensign have certainly been advertising the green TAs in the trade press but they don't seem to be on their own website. Ah yes. I've had a look through the last couple of Bus & Coach Buyer. Interesting the Y plate Tridents are being advertised with Cummins ISC engines - did they realise they were sold knackered motors and re-engine them? 9733-35 were trash at the very end. V plates currently on sale. Think 9705 and 9718 were in ok condition! One thing I must say about 9735 is that the pullaway revvs on her appears to finally be remapped as the then Connex batch were the only euro2 ZF variants within London operators not to get the remapp from their initiall soft pullaway factory settings. 9736 still has the original settings but performance makes up for it post-pullaway.